The HIV 1.2.O Rapid Test Cassette (Whole Blood/Serum/Plasma) is a rapid chromatographic immunoassay for the qualitative detection of antibodies to Human Immunodeficiency Virus (HIV) type 1, type 2 and subtype O in whole blood, serum or plasma to aid in the diagnosis of HIV infection. The HIV 1.2.O Rapid Test Cassette (Whole Blood/Serum/Plasma) is a qualitative, membrane based immunoassay for the detection of antibodies to HIV-1, HIV-2, and Subtype O in whole blood, serum or plasma. The membrane is pre-coated with recombinant HIV antigens in the test line regions, T1 and T2. The T1 test line is pre-coated with HIV-1 and Subtype O antigen and the T2 test line is pre-coated with HIV-2 antigen. During testing, the whole blood, serum or plasma specimen reacts with HIV antigen coated particles in the test strip. The mixture then migrates upward on the membrane chromatographically by capillary action and reacts with recombinant HIV antigen on the membrane in the test line region. If the specimen contains antibodies to HIV-1 and/or Subtype O, or HIV-2, one colored line will appear in the test line region; if the specimen contains antibodies to HIV-1 and/or Subtype O, and HIV-2, two colored lines will appear in the test line region. Both indicate a positive result. If the specimen does not contain HIV-1, Subtype O, and/or HIV-2 antibodies, no colored line will appear in the test line region indicating a negative result. To serve as a procedural control, a colored line will always appear in the control line region indicating that proper volume of specimen has been added and membrane wicking has occurred. POSITIVE: Two or three distinct colored lines appear. One line should always appear in the control line region (C), and another one or two apparent colored line(s) should appear in the test line region(s) (T1 and/or T2). NEGATIVE: One colored line appears in the control region (C). No apparent colored lines appear in the test line regions (T1 and T2). 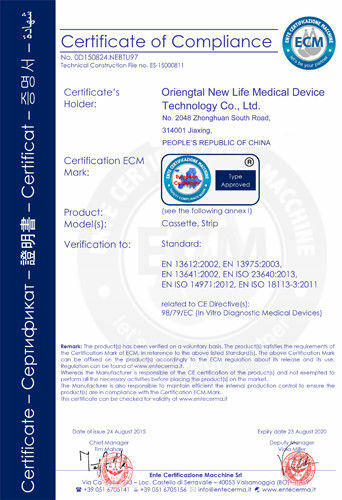 The HIV 1.2.O Rapid Test Cassette (Whole Blood/Serum/Plasma) is for in vitro diagnostic use only. The test should be used for the detection of HIV antibodies in whole blood, serum or plasma specimens only. 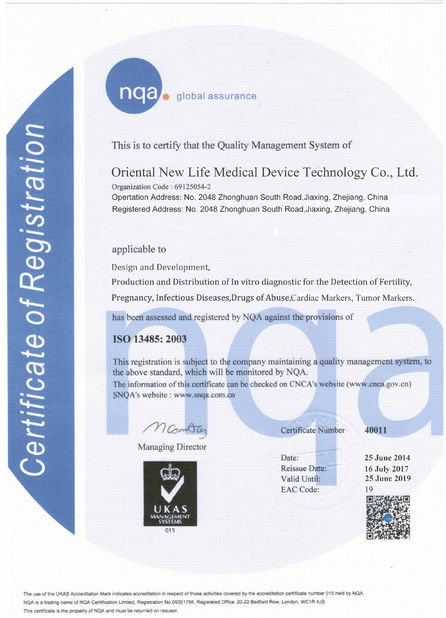 Neither the quantitative value nor the rate of increase in HIV antibodies can be determined by this qualitative test. 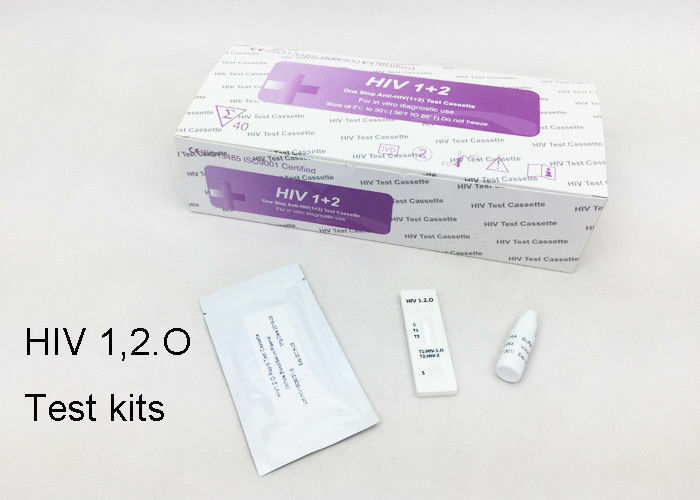 The HIV 1.2.O Rapid Test cassette(Whole Blood/Serum/Plasma) will only indicate the presence of HIV antibodies in the specimen and should not be used as the sole criteria for the diagnosis of HIV infection. As with all rapid test cassettes, all results must be interpreted together with other clinical information available to the physician. If the test result is negative and clinical symptoms persist, additional testing using other clinical methods is recommended. A negative result does not at any time preclude the possibility of HIV infection. The HIV 1.2.O Rapid Test cassette (Whole Blood/Serum/Plasma) has correctly identified specimens of seroconversion panel and has been compared to a leading commercial ELISA HIV test using clinical specimens. The results show that the relative sensitivity of the HIV 1.2.O Rapid Test cassette (Whole Blood/Serum/Plasma) is >99.9% and the relative specificity is 99.9%.